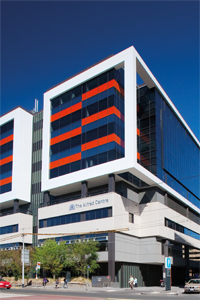 The Central and Eastern Clinical School (CECS) was founded in 2001 at the Alfred Medical Research and Education Precinct (AMREP) when the Monash University Faculty of Medicine, Nursing and Health Sciences restructured itself into 7 schools. A restructure of CECS in 2008 created two schools, both based at AMREP, the Central Clinical School (CCS) and the School of Public Health and Preventive Medicine (SPHPM). CCS has subsequently grown to include entire new departments. See School Structure. CCS is co-located with the Baker and Burnet Institutes at AMREP. CCS has been affiliated with Alfred Health for clinical medical teaching since the initial establishment of the Monash Department of Medicine in the 1960s and the associated build of the Monash Medical School at the Alfred. In 2015, the school celebrated the 50th anniversary of the founding of the Monash Department of Medicine at the Alfred. See detail. CCS is a Melbourne based centre for clinical and biomedical research and education, offering undergraduate and postgraduate study programs at AMREP. CCS is a core hub for translational research and medicine, covering a great breadth of subject areas. CCS's research is highly collaborative, both within the AMREP precinct, nationally and internationally with world leaders in biomedical and clinical research. With such close links to health care providers we are able to rapidly move towards health outcomes in improved patient care. The Central Clinical School encourages multidisciplinary research across separate fields and attracts elite students, researchers and teachers to its well equipped research laboratories and facilities. To contribute to the treatment and cure of several specific diseases the school incorporates its research products into clinical practice and joins with commercial ventures. Research is undertaken by the Departments of Allergy, Immunology and Respiratory medicine, Anaesthesia and Perioperative Medicine, Diabetes, Gastroenterology , Haematology, Immunology and Pathology, Infectious Diseases, Medicine, Neuroscience and Surgery, and specialist centres such as the National Trauma Research Institute, the Monash Alfred Psychiatry Research Centre, the Melbourne Sexual Health Centre and the Australian Centre for Blood Diseases. CCS coordinates the teaching of Monash’s medical students at the Monash-affiliated teaching hospitals of Alfred Health, Cabrini Health Australia and Peninsula Health, overseen by the CCS Undergraduate Medical Education Directorate. Students benefit from The Alfred's breadth of operation, as it has a unit in every specialist medical and surgical discipline, except Paediatrics and Obstetrics, and has major trauma, burns and heart & lung transplant departments. CCS has a structured clinical teaching program that extends beyond Patient and Theme Based Learning with timetabled teaching in most specialist medical disciplines offered by the hospital. Emphasis is based on bedside skills as well as theoretical knowledge. An extensive lecture and tutorial program is given by senior clinicians. Access is available to the latest in research and development advances in medicine and a challenging and supportive learning environment is offered with a recent extensive refurbishment of teaching space in the Alfred Centre. CCS also teaches more than a thousand undergraduate students annually in immunology and human pathology in science and biomedical science streams, which recruit into a substantial Honours cohort. Many opportunities for PhD studies are available. Graduate research students benefit from two recently launched initiatives: the Translational Research themed PhD run through Monash’s clinical schools and the accelerated milestone PhD for medical education students. Check our Departmental web sites for details of projects available.